When I was growing up, one of my favorite Easter decorations was my mom’s pink sugar egg. It was so pretty and delicate! I’ve sometimes seen fake sugar eggs available commercially, but they’re usually made of Styrofoam, and just not the same. So this year, I decided to make my own sugar eggs! I am so happy to have my own sugar eggs to display for years to come! 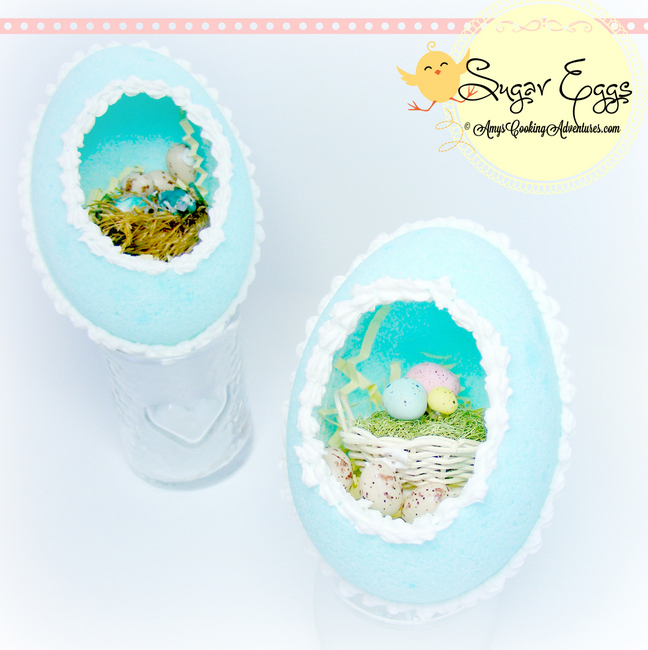 I used this tutorial to make the sugar eggs. I found my panoramic egg mold on amazon. I used this royal icing recipe, and I found the sweet little birds nests, eggs, and baskets atMichaels. wow, so impressive!!! beautiful too! Thanks for linking up to Tasteful Tuesdays! love it! Really appreciate you stopping by my blog! I'm trying to keep in better touch with my linkers/readers... If you already follow me, please let me know I will find your blog on Bloglovin (I'm transferring my follows there)if you don't follow in any way, would you consider following via GFC or other method? My mom bought us some of these when I was little. Like maybe 4 or 5. And I still remember how much I loved getting them for Easter! The one's she got were real sugar - she let us eat them, which in hind sight seems crazy because they are so beautiful! Thanks for the memory!! Yours turned out incredible, btw! I did this a long time ago but mine got broken when we moved - you have reminded me of a great project to do with my kids! Found you through the Earning My Cape Super Link Party! Oh my gosh- my mom used to make these when I was a kid!!! I had forgotten all about them. Thank you for posting these & giving me a huge smile. Great job on them too! Those are so pretty. Thanks for the link to the tutorial. I haven't made these with my kids yet and I know they would have so much fun doing this.